There are many different epilators on the market that will suit your hair removal needs. Finding one that fits your preferences can be a challenge with so many to choose from. We looked at 20 of the most popular epilators and noted their performance, durability, speed choices, attachments offered, customer satisfaction, and other important features and narrowed the choices down to these three that topped the list in all of these categories. Any one of these three would provide you with excellent results that will last as much as 4 weeks. All epilators work similarly: they have multiple tweezers to pluck out unwanted hair swiftly. It may sound painful but it is not. Once you get used to using an epilator, getting rid of unwanted hair will feel like second nature. The more you use it the less often you will have to. It produces the same results that waxing does with the mess that goes along with waxing. Have smooth legs for weeks with Emjoi Epilator. It removes hair from the roots without the pain of waxing. Even if you have never used an epilator before, you will not have a hard time using this epilator. It is very gentle on your skin and can be used from head to toe. There are two speed settings to choose from and an ergonomic grip that makes handling comfortable and easy. The Emjoi Epilator removes hair as short as .5 millimeter. There are 21 hypoallergenic discs and a washable head that is removable to ensure a completely hygienic experience with the epilator. The efficiency cap allows the epilator to be used on sensitive body areas including knees, ankles, underarms, and the bikini line. Choose between the two speeds: gentle and efficient, with the press of a button. The gentle speed allows you to carefully take care of these sensitive areas without irritation. With the Emjoi Epilator there will be no irritation, nicks, cuts or raised red bumps that razors, waxes or chemicals can charge. 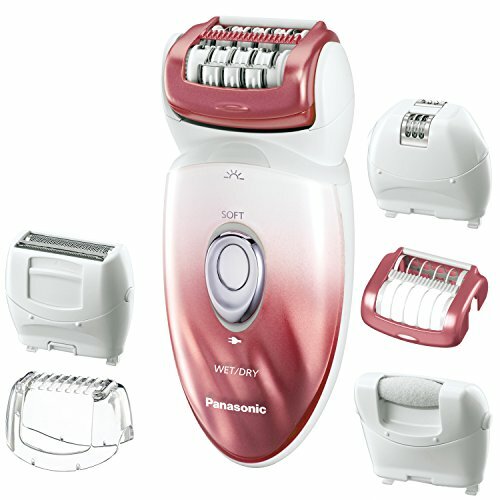 Panasonic offers women a multi-functional, 100% washable way to get smooth legs for a long time with the ES-ED90 Wet/Dry Epilator. 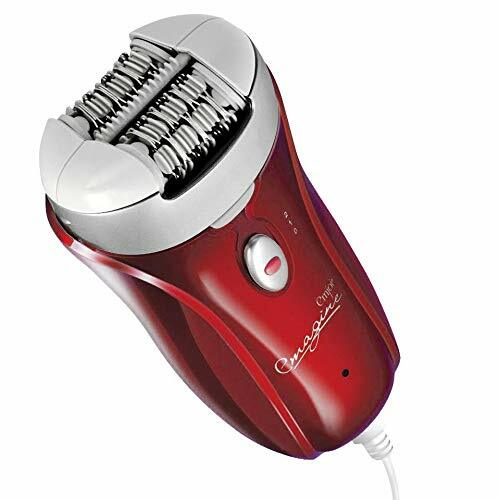 It has a dual speed motor and 6 snap-on attachments for hair removal and pedicure tasks. The included shaver head has hypoallergenic blades and foil for safe hair removal even on sensitive skin. The pop-up trimmer is used to capture stray hairs and to trim and maintain the bikini area. The Wide, dual-disc Epilator conforms to your body contours making it perfect for legs and arms. Because of the ability to use this product wet or dry, you will love the shaver/epilator that can be used in the shower or bath without fear of the water ruining it. The built in LED light provides plenty of illumination to light up the lighter, thinner hairs that are harder to see. The pedicure buffer attachment adds a pedicure feature to the epilator so you can remove dry rough skin from your feet as well. 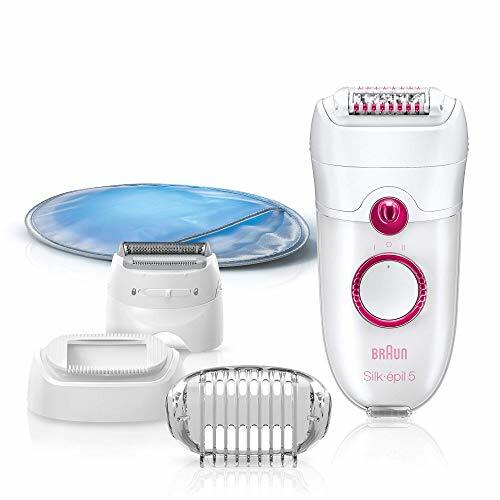 The 6 attachments included are a pedicure buffer, dual-disc Epilator Head, Epilator Gentle Cap, Gentle Epilator Head, Shaver Head, and Bikini Comb. There is a travel pouch and cleaning brush included. Use this epilator with your favorite gel, soap, or foam or use it safely dry as well. Braun is a very famous name in shavers. The Braun Epilator is a real pleaser with the speed personalization that allows you to select the right speed for your specific hair removal needs. You’ll be able to safely and easily remove hairs as fine as .5mm (a grain of sand) from the root and leave your skin super smooth for up to 4 weeks. Illuminate the harder to see hairs with the Smartlight that will help you find them easily. The extra gentle epilation has a comfort system that is a combination of high frequency rollers that massage and a cooling glove that will sooth the skin after you are done with the hair removal process. The Braun Silk-epil comes with three attachments that include a shaver head, a trimmer cap and an efficiency cap. The design of the epilator adapts to every contour for better skin contact and gentle performance. If you are looking for a good quality epilator, take a look at any one of these three choices. They feature multiple speeds, attachments and illumination that makes the whole epilation process fast and efficient even if you are not familiar with using one. We looked at 20 of the most popular epilators and noted their performance, durability, speed choices, attachments offered, customer satisfaction, and other important features and narrowed the choices down to these three that topped the list in all of these categories. Any one of these three would provide you with excellent results that will last as much as 4 weeks. We have provided you with a buyer’s guide that will give you the information you need about epilators so you can make an informed decision and get the one that will fulfill your needs and preferences. What is Epilator for Women? There are many reasons that people choose epilators over other methods of hair removal. We have outlined the most popular reasons that people purchase and use epilators. These reasons can give you an idea of what using an epilator will do for you as well. Using an epilator is cheaper than waxing – There is an initial cost involved in purchasing an epilator, but after that initial cost, you will have what you need to remove unwanted hair and will not have to spend any more money for visits the way you do when you get professional waxes. More affordable than regular shaving – Buying razor blades and shaving cream can be a lot more expensive than investing in an epilator. A good choice for sensitive skin – waxing and hair removal creams can cause irritation to sensitive skin. Using an epilator will not cause these problems. Less painful than other methods of hair removal – Once you have done the first session, you will find that using an epilator is a lot less painful than other methods. Takes less time than shaving, waxing or hair removal cream – You will usually be able to wait at least 2-3 weeks in between sessions with an epilator and the re-growth you get will be softer and smoother as well. Waxing, despite the pain involved, has many fans because of the smooth, soft results it provides. The drawbacks to waxing include the expense of regular professional visits, the hassle of trying to do it correctly yourself and the cost of the supplies on a regular basis. Home waxing tends to be a lot more difficult than having it done in a salon. Even though it’s cheaper, the results are not as good as what a salon accomplishes. Epilation can be carried out in the privacy of your own home and is quick and easy for the most part. By removing the hair at the root, re-growth is slower and finer. Epilators can be used on any part of the body, including the face. It’s a great choice for those with sensitive skin and can be used without irritation. After the first initial cost of the epilator itself, there are no other costs involved. The following features and factors are involved in choosing the right epilator. Make sure that the epilator you choose removes the hair from the root and doesn’t just cut it at the surface of the skin. Removing it at the root will allow for a smoother finish and also more time between sessions. Look for epilators that have a good amount of tweezers. A higher number of tweezers will reduce the amount of each epilation session. The larger number of tweezers will make removing hair from the legs much easier since that is a larger area. Hygiene is extremely important so look for epilators that are easy to clean up. Many simply require rinsing off to keep it clean and ready to use. Many epilators have attachments that make the epilator even better. Make sure that the models you look at have an efficiency cap as one of the attachments. The efficiency cap eases the pain of epilation and makes the whole process much more comfortable to do. Having a built in light to illuminate the lighter, fairer hairs as well. This ensures a thorough hair removal process. A wet/dry epilator can be used in the shower or dry and offers the user much more versatility. Using the epilator in the shower opens the pores and makes epilation a lot less uncomfortable. Multiple speeds are preferable if available. Most epilators have two speeds but some models just have one. You will find that the two speed models are more efficient and the different speeds can be used for different areas of the body. There are corded epilators and cordless varieties as well. Choose the one that will be the most convenient for you. Many like cordless because they can use it in the shower. This feature is up to personal preference and works well both ways. Extra accessories like cooling gloves and massaging heads make using the epilator even better and more convenient. Look for epilators that have multiple accessories to use to make the epilation process less painful and more efficient. Take a warm bath – You will get much better results if your skin is soft. If you are using a dry epilator, take a shower or bath before using to ensure the best results and have the skin ready for epilating. Don’t use cream or lotion – Unless it is pre-epilating wipes, you don’t want to use any creams or lotions before you use the epilator. It will make it very difficult for the tweezers to grab the hairs. Rub the skin – Before you start your epilation session, rub the skin to lift the tiniest, shortest hairs into an upright position which makes them easier to grab and provides a smoother result. Run in the opposite direction – When using the epilator, be sure to run it against the direction the hair grows. Epilators that have a pivoting head will make using it around tricky areas, like the knees, much easier. Soothe the skin after the session – After you are done with your session, be sure to soothe your skin by using a moisturizing lotion or cream. As more and more excellent quality epilators enter the market, the popularity of epilation will continue to increase. It is an affordable and long lasting method of hair removal that women are using thanks to the excellent results that can last as long as 2-3 weeks or more. There are many different models and styles of epilators on the market that have many different features. If you are looking for a simple and easy to use method of removing unwanted hair, you will definitely want to take a look at using an epilator. They are very inexpensive and can range from as low as $20 dollars all the way up to over $100 depending on what you are looking for in terms of features and quality. The information in this buyer’s guide is designed to help buyers choose the right epilator for their needs and preferences. The right knowledge will enable you to make the right choice that will provide an epilator that you enjoy using and will use for a long time to come.